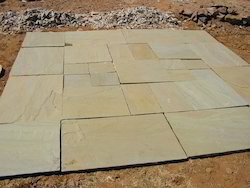 Pioneers in the industry, we offer Sandstone Paving such as Buff Sandstone Paving, Brown Sandstone Paving, Camel Dust Sandstone Paving, Desert Sandstone Paving, Grey Sandstone Paving, Mix Sandstone Sawn Paving and many more items from India. 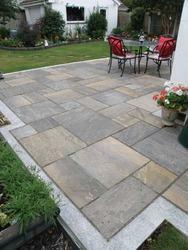 These Garden Sandstone paving slabs are very popular in European countries. 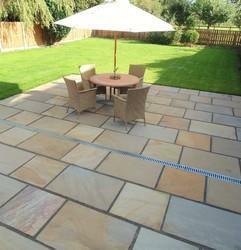 These garden sandstone paving slabs available with various sizes and finishes. These garden sandstone paving slabs are also availble with various colors like Brown, white, golden, buff etc. 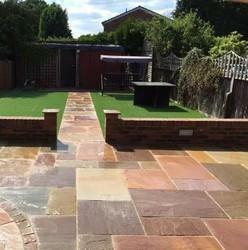 These Garden sandstone paving slabs are available with wholesale prices. 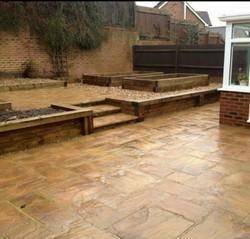 We also provide the installation facility for garden sandstone paving slabs supplied by us. We are leading manufacturer and supplier of Natural Cobble Stone from Rajasthan, India have cobblestone stockyard in Dabi, it is situated on national highway kota-Udaipur road. We have stock of various colors available in sandstone like Grey, Brown, chocolate, white sandstone cobbles. 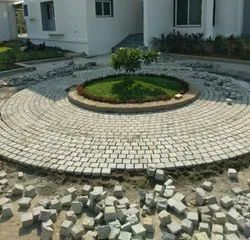 Natural cobble stones are highly demanded by architects, builders and landscapers for outdoor applications like pathways, driveways, Roads etc. We are leading quarry owner, manufacture and wholesaler of Brown Indian Sandstone Paving from Bijolia, Rajasthan , India. 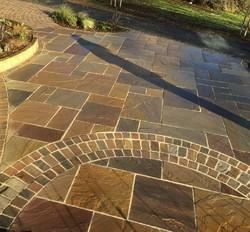 Brown Sandstone is very popular for the Flagstone and best pavement for exterior and interior pavement. We supplying indian paving stone to various dealers all around the world and in domestic market also. These Brown Indian Sandstone paving are highly demanded for exterior flooring, Garden road, Pathways, Driveways and in Many landscaping projects. We have marked a distinct and dynamic position in the market by providing a high quality array of Buff Sandstone Paving. Suitable for garden patios, pathways, driveways and streetscapes, this paving is processed using premium quality raw material and advanced technology. Our quality examiners test this paving against different parameters so as to ensure its quality. Apart from this, we offer this paving at market leading prices. Our honest business standards and quality-excellence has helped to come up with a wide range of Desert Sandstone Paving Tiles. Considering its usage, our adroit professionals process this sandstone paving using the best quality raw material and innovative technology. To cater the diversified needs of our clients, we provide this sandstone paving in variety of colors, sizes and styles. 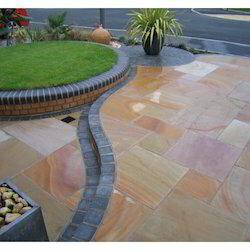 Besides, clients can avail this sandstone paving from us at nominal prices. Use of sandstone tiles in areas like chemical industries (storage tanks of acid and alkalies in floor and in chimney and duct areas); in effluent treatment plants & electro plating industries. Other than this, these are also used in industry sectors such as sugar, cement, paper, fertilizers, pesticides, pharmaceuticals, breweries, bottling plants and others. Some of its features include breakthrough strength suitable for use in heavy duty flooring, provides superior resistance to all acids, alkalies, suitable for paving and cladding applications and others. We are leading manufacturer and supplier of Indian Sandstone Paving from rajasthan India. Being the most respected organization guided by experienced and knowledgeable professionals, we provide an enormous assortment of Indian Sandstone Paving. Indian Sandstone paving are available in various colors, Kandla Grey Paving, Rajgreen Paving, Autumn Brown Paving, Chocolate sandstone Paving, Cameldust Sandstone Paving, Desert Sandstone Paving. We rae leading manufacturer and supplier of Indian Rajgreen Sandstone Paving from Bijolia, Rajasthan, India. Being one of the prominent organizations, we are involved in offering rajgreen sandstone paving. These are extensively demanded by various numbers of clients owing to its unmatched quality, durability and less maintenance cost. Following the exact specifications of clients, we offer these tiles in various styles, finish and designs. Our tiles are unique and eye-catching. Now a days use of sandstone in areas like chemical industries (storage tanks of acid and alkalies; in floor and in chimney and duct areas) in effluent treatment plants & electro plating industries. Other than this, these are also used in industry sectors such as sugar, cement, paper, fertilizers, pesticides, pharmaceuticals, breweries, bottling plants and others. Some of its features include breakthrough strength suitable for use in heavy duty flooring, provides superior resistance to all acids, alkalies, suitable for paving and cladding applications and others. 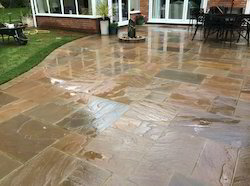 Being the most respected organization guided by experienced and knowledgeable professionals, we provide an enormous assortment of Autumn Brown Sandstone Paving. 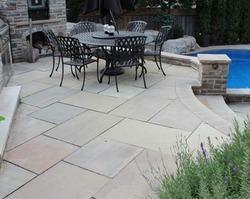 The offered sandstone paving is made available to our clients in various designs, colors and styles. Our provided sandstone paving has many natural tonal variations, differing riven profiles and exquisite natural veining. 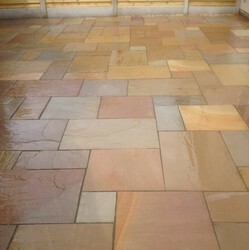 Clients can avail this sandstone paving from us in pocket friendly prices. We are leading manufacturer, exporter and supplier of sandstone charcoal Black Paving Stone from India. Charcoal black sandstone are also known as sagar black sandstone. Charcoal is a very consistance stone in sahdes of medium to dark grey. The flamed finish provides an anti-slip surface and creates an even texture that emphasizes the uniformity of color from stone to stone. As an understand backdrop to a vibrant landscaping project or as the darker contrast to anchor to lighter space, this stone has an elegance that will span a decades of landscaping trends. We are providing our esteemed clients a wide range of Camel Dust Sandstone Paving that is used for decorating the floors. The offered sandstone paving is processed by using optimum quality raw material and cutting edge technology in adherence with industry norms. 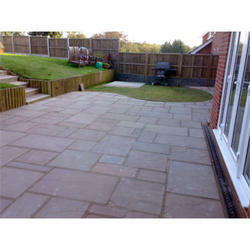 Our provided sandstone paving is easy to install, crack free and slip resistance. Due to the varied demands of the clients, this sandstone paving is made available in variegated customized options. • Pathway paving, driveway paving, outdoor flooring, industrial flooring, acid proof flooring tiles, landscaping stones. We are leading manufacturer and supploer of Grey Sandstone Crazy Paving. We supply these crazy paving with zigzag sizes as per customers requirements. 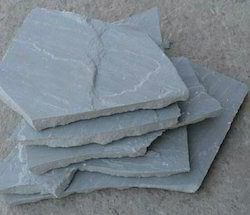 Grey sandstone crazy paving could be use for outdoor paving, garden paving, pathway paving, driveway paving. We are leading manufacturer, exporter and supplier of Sandstone Patio Paving from Bijolia, Rajasthan, India. 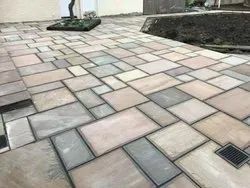 Our range of sandstone patio paving slbs are includes Rajgreen sandstone patio Paving, Kandla Grey sandstone patio paving slabs, Autumn Brown sandstone Patio paving slabs, Ravina sandstone patio slabs etc. Use of sandstone tiles in areas like chemical industries (storage tanks of acid and alkalies; in floor and in chimney and duct areas) in effluent treatment plants & electro plating industries. Other than this, these are also used in industry sectors such as sugar, cement, paper, fertilizers, pesticides, pharmaceuticals, breweries, bottling plants and others. Some of its features include breakthrough strength suitable for use in heavy duty flooring, provides superior resistance to all acids, alkalies, suitable for paving and cladding applications and others. We are leading manufacturer, exporter and wholesale supplier of Sandstone Paving Slabs from Bijolia, Rajasthan, India. Sandstone Paving slabs are available in with various colors and finishes. Sandstone paving slabs are available in Kandla grey Sandstone paving slabs, Autumn Brown Sandstone paving slabs, Chocolate sandstone paving slabs, Buff Sandstone paving slabs, Raj Blend Sandstone paving slabs etc. Paving Slabs are available with Natural handcut Finish and calibrated. We offer customised sizes and finished according to the customer's desire. We are leading manufacturer and supplier of Sandstone Paving Slabs from Bijolia, Rajasthan, India. 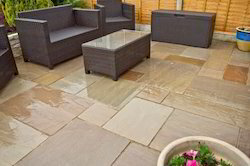 Our range of sandstone paving slabs are includes, Raj Green sandstone Paving slabs, Kandla Grey sandstone Paving slabs, Autumn Brown Sandstone Paving Slabs, Chocolate Sandstone paving Slabs etc. In India use of sandstone tiles in areas like chemical industries (storage tanks of acid and alkalies; in floor and in chimney and duct areas) in effluent treatment plants & electro plating industries. Other than this, these are also used in industry sectors such as sugar, cement, paper, fertilizers, pesticides, pharmaceuticals, breweries, bottling plants and others. Some of its features include breakthrough strength suitable for use in heavy duty flooring, provides superior resistance to all acids, alkalies, suitable for paving and cladding applications and others. We are leading manufacturer, exporter and supplier Sandstone Paving Tiles from Rajasthan. 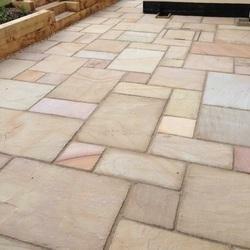 Sandstone paving tiles are available at wholesale prices, customised sizes and finishes. Sandstone Pving Tiles are available in Various colors like, Kandla Grey Sandstone tiles, Autumn Brown Sandstone Tiles, Raj Green Sandstone tiles etc. Now a days sandstone paving tiles are highly used in areas like chemical industries (storage tanks of acid and alkalies; in floor and in chimney and duct areas); in effluent treatment plants & electro plating industries. Other than this, these are also used in industry sectors such as sugar, cement, paper, fertilizers, pesticides, pharmaceuticals, breweries, bottling plants and others. 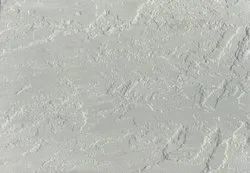 Some of its features include breakthrough strength suitable for use in heavy duty flooring, provides superior resistance to all acids, alkalies, suitable for paving and cladding applications and others. We are leading manufacturer and supplier of the lying Indian Sandstone Paving Slabs from Bijolia, rajasthan, India. We have marked a distinct and dynamic position in the market by providing a high quality array of laying Indian Sandstone Paving. Suitable for garden patios, pathways, driveways and streetscapes, this paving is processed using premium quality raw material and advanced technology. Our quality examiners test this paving against different parameters so as to ensure its quality. We are leading manufacturer and supplier of indian sandstone paving. 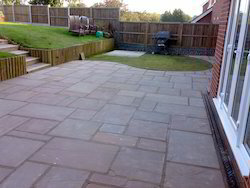 We hold expertise in offering Mix Sandstone Sawn Paving. These are very appealing and eye-catching and admired for uniqueness and elegance. With the availability in various range, designs finish and thickness, these tiles are extensively recommended by various numbers of clients. Our products are admired for their easy maintenance and stain and scratch resistance. 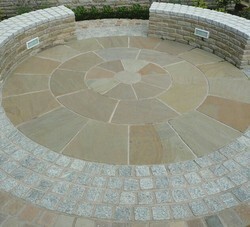 Sandstone Circle Paving is available with various shapes and sizes with different colors as per customers choice. We are leading manufacturer, exporter and wholesale supplier of Indian Sandstone Patio Paving Slabs from Bijolia, Rajasthan, India. Sandstone Patio Slabs are available in with various colors and finishes. Sandstone patio slabs are available in Kandla grey Sandstone, Autumn Brown Sandstone, Chocolate sandstone , Buff Sandstone, Raj Blend Sandstone etc. Patio Slabs are available with Natural handcut Finish and calibrated. We offer customised sizes and finished according to the customer''s desire. We are leading manufacturer, exporter and wholesale supplier of Sandstone Paving Circle from Bijolia, Rajasthan, India. Owing to the presence of our expert team members, we have been able to offer a wide range of pattern in sandstone paving circle.These are exclusively designed and developed using best available technologies and following international industrial standards. Our products are praised for their easy maintenance, maximum durability, reliability and fine finish. 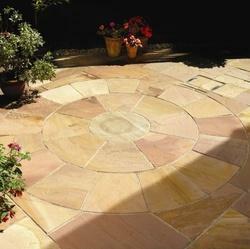 These Sandstone paving circle are available at budget friendly prices.